With 5G commercial networks beginning in 2020, Ericsson (NASDAQ:ERIC) is supporting operator requirements for field trials as early as 2016 with the introduction of 5G Radio Prototypes that operators can deploy in live field trial environments. Phase two of the award-winning Ericsson 5G Radio Test Bed, Ericsson 5G Radio Prototypes are the first products designed to enable operators to conduct live field trials. Mobile operator in Japan, NTT DOCOMO, INC., is currently using the 5G Radio Test Bed and will receive prototypes for field trials. As with past mobile generations, leading operators are keen to gain a first-mover advantage in 5G. 5G will impact the entire mobile network and associated eco-system, from devices to radio access, virtual evolved packet core (vEPC) and into the cloud. Operator differentiation will not be based on lab trials but on what they are able to achieve in live network environments. Smaller and more powerful, the prototypes build on insights gained from testing on Ericsson's 5G Radio Test bed, together with operators, in both indoor and outdoor environments. Seizo Onoe, EVP and CTO, NTT DOCOMO, says: "We are pleased to take the next step toward testing in realistic network environment. Tokyo Olympics and Paralympics will be a great opportunity to propose many different use cases of 5G, which will be launched on 2020. We expect that this would lead to even further opportunities. Ericsson's 5G Radio Prototypes will help us to gain insights into the potential for 5G in our network environment and market, to open up new possibility to enable new services for our customers and partners." Ericsson 5G Radio Prototypes leverage the technology innovations enabled by the lab-testing and live outdoor and indoor testing from phase one of the Ericsson Radio Test Bed, already deployed in the US, Japan, Korea and Sweden. These prototypes can integrate with Ericsson's market-leading network functions virtualization (NFV) applications to enable network-wide slicing, addressing the diversity of 5G network use cases. Arun Bansal, Senior Vice President and Head of Business Unit Radio, Ericsson, says: "In order to be ready in such an aggressive time frame, it's high time testing move into real world environments for practical application. These new 5G Radio Prototypes are the size of a carry-on and weigh around 40 lbs. - less than 20 kg. As a leader in standardization, it's important for us to be able to contribute with hard data rather than just theoretical discussions." Markedly smaller than Ericsson's 5G Radio Test Bed, despite added technology, the new prototype is packed into a compact, easy to deploy form factor, which resembles a carry-on suitcase and weighs roughly 40 lbs. (18 kg). Ericsson is leading and driving the 5G standards work from today's exploratory research and pre-standard field trials, through standardization activities along with influential standards bodies and industry groups. Through key technology advances like the Ericsson 5G Radio Prototypes and cloud-based network slicing, Ericsson and its operator customers will be key players in defining this next generation of network technology all the way through to commercialization. 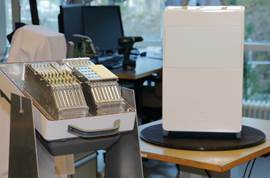 Ericsson 5G Radio Prototypes pack high-performance 5G capabilities into a carry-on sized form factor.